I found Bridal Dream after an officiant I had booked elsewhere bailed on us. Robert was very quick to respond through the whole process. We requested Pastor John Fuchigami after seeing a few videos of some ceremonies he did. He's so eloquent and more important is a Christian minister. It was just the 2 of us for our ceremony and we showed everyone the video when we got back and it inspired our married friends to renew their vows. We couldn't have asked for better and the whole process was so easy. We felt his professionalism and eloquent speech are unparallelled. 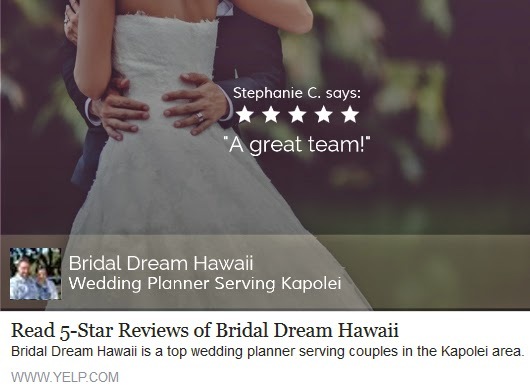 We highly and enthusiastically recommend them to anyone who is going to get married in Hawaii."